Do you regularly bear the brunt of heel pain or arch pain? You’re certainly not alone. These symptoms are among the most frequent complaints when it comes to diagnosing foot and ankle conditions. While several potential reasons exist for these types of pain, the most common culprit is plantar fasciitis. Plantar fasciitis is an inflammation of the plantar fascia, a thick band of tissue along the bottom of your foot that connects the heel bone to the toes. This band supports the arch of the foot, but its position places it on the front lines and it endures substantial amounts of force. The fascia flexes to absorb impacts, but can develop small tears when the tension becomes too great. Continuous stretching and tearing may eventually inflame the plantar fascia, leading to heel pain. The most frequent causes of plantar fasciitis are natural faults in the structures of lower limbs. Those with high arches, flat feet, or tight calf muscles tend to place more stress on the plantar fascia and are more susceptible to inflammation. The condition is more common in women and people aged 40-60, however, people of all ages can develop this painful problem. 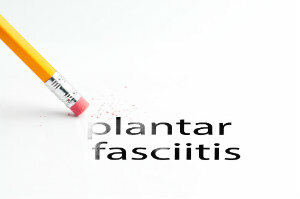 Your lifestyle can also contribute to developing plantar fasciitis. Obesity, wearing unsupportive footwear, and standing for long hours on hard surfaces all increase the likelihood of heel pain. Inflammation is also common if you are a runner, dancer, or other athlete and your feet regularly impact flat, hard surfaces. This is especially true if you suddenly increase the intensity of your workouts without the proper conditioning. The pain of plantar fasciitis is often felt in the bottom of the heel or the arch of the foot. It tends to be described as a stabbing sensation that feels worse after rising in the morning or after you’ve been sitting for a long period of time. The pain tends to temporarily lessen after some movement and stretching, but may slowly grow worse over several months. Plantar fasciitis is often connected to the formation of heel spurs, calcium deposits on the underside of the heel bone. Although they sound sharp, they do not tend to be a source of pain. In most cases, pain in the heel or arch will respond well to rest and conservative treatments. Limit activities that may continue to aggravate the heel and discourage recovery. The use of ice and prescribed medications may reduce pain and inflammation. Night splints, insoles and laser treatments are very effective in relieving symptoms. Stretching exercises may also be recommended to ease pain, increase mobility, and strengthen the area. Switching from flimsy or worn out shoes to pairs with stronger arch support can prove effective in reducing stress on the plantar fascia. In many cases, a custom orthotic may be suggested to help correct problems caused by foot structure and properly redistribute weight. If the pain continues for a number of months and has not responded to any other treatments, surgery may then become a rare option. Don’t try to ignore or work around heel pain or arch pain. Without knowing the source of the problem, you may be setting yourself up for further pain and injury in the future! Let Harvey Danciger, DPM and his staff determine the cause of your pain and arrange a treatment plan that fits your specific needs. Call our office at (760) 568-0108 or use our online form to schedule an appointment.